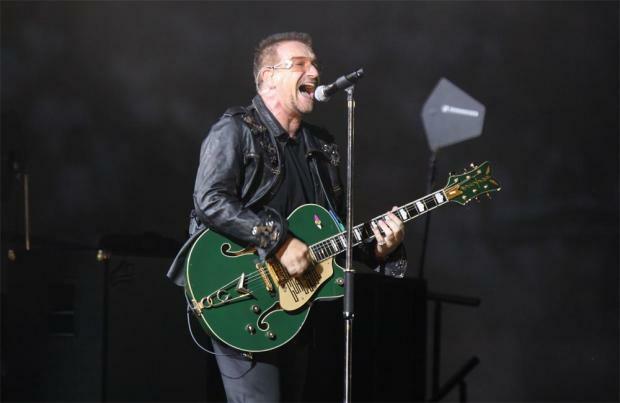 Bono "doesn't know" if U2 will tour again. The 'One' hitmakers are currently on the road on their 'Experience and Innocent' concert series - which started in May and ends in November - and the 58-year-old singer admitted performing live night after night isn't as easy as it used to be, especially in the wake of his much-publicised mystery brush with death two years ago. He said: "I can't do as much as I used to. On previous tours I could meet a hundred lawmakers in between shows and now I know I can't do that. "This tour is particularly demanding. "Whether you have a face-off with your own mortality or somebody close to you does, you are going to get to a point in your life where you ask questions about where you're going." Asked if that means there won't be another tour, he told the Sunday Times magazine: "I don't know. I don't take anything for granted." And drummer Larry Mullen - who requires an hour of physio an hour before and an hour after each concert to cope with the physical demands - suggested there is at least a "really long" break on the cards for the band, though doesn't think they'll quit music for good. "I assume there'll be another album. I don't know that anybody needs another U2 record or tour anytime soon. "People could do with taking a break from us and vice versa." Guitarist The Edge is worried about his friend and frontman's health. "He has a very ambivalent attitude to his physical self. He doesn't naturally take responsibility for his physical wellbeing. Which is fine in your twenties, but you get to a certain point ... It is a difficult shift for him. If you spend too much time thinking you are old and past it, you probably can't do it any more."